The arms stretch 21-1/2" across in the closed position. The housing is front side mounted with 4 screws. The spacing on the outside screws are 7" on center, and 6" on the inter screws. 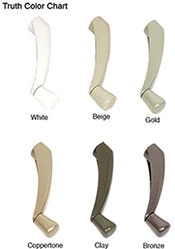 The Wi11454 handle in matching color is included with the operator along with the Sash Hook Wi20008. Truth 11.30 Awning Operator 11-3/8"